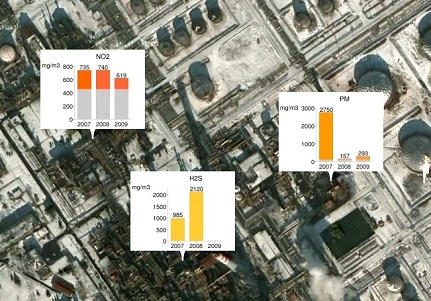 Description: The project was initiated based on the Agreement on purchase and sale of NIS shares between Republic of Serbia and Gazprom Neft in accordance to which Gazprom Neft has the obligation related to the reconstruction and upgrade of NIS process facilities and to improvement of the environmental safety of production processes. The tender as well as Technical assignment, was approved by the competent ministries of the Republic of Serbia (Ministry of Environment and Spatial Planning at the time). Steinbeis Advanced Risk Technologies GmbH and D’Appolonia S.p.A, both having experiences in similar projects in Serbia, as a consortium, have won the tender in a very strong competition (17 companies / consortia have submitted their bids). The project included 12 samples of the NIS a.d. manufacturing facilities i.e. two oil refineries, one gas refinery, two petrol station, two tank farms, two service units, and three collection or/and dispatch centers. Beside results of assessments, the project delivered a list of the priority corrective actions to be implemented in the short/medium/long term periods, in order to reduce the environmental risks. The project team, consisting of 20+ international and local experts for environment, health and safety issues, has started the work in July 2010 and successfully completed the project in four phases, in January 2011 when final reports were submitted. Reports were prepared in two languages (English and Serbian) for each of the 12 facilities which were the subject of ecological assessment. That makes 24 reports with about 2500 pages. The reports contain description of actual environmental status (soil, groundwater, waste water and air), evaluation of EHS management, as well as assessment of potential environmental risks and proposals for corrective measures. The results of the study were presented at the press conference on March 17, 2011 in the Serbian Government’s press room, Nemanjina 11 in Belgrade and praised as "one of the best and the most comprehensive studies, ever performed in Serbia".